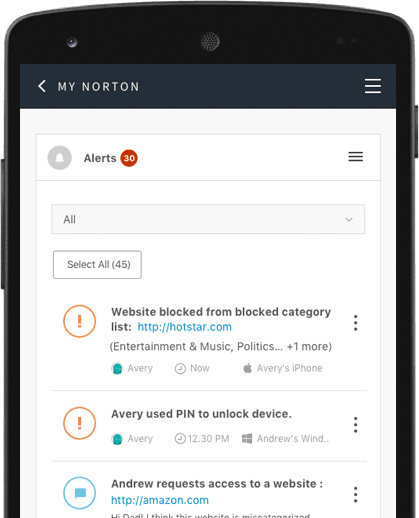 Norton Family parental control software helps protect your kids from online predators by showing you what your kids are doing online and identifying potential dangers before they become problems. Enable your kids to enjoy the Internet while protecting them from unsuitable content and apps with Norton’s award-winning parental control software. Stay in the know about which sites your kids are visiting and block harmful or inappropriate sites. See which apps your kids have downloaded on their Android devices, and choose which ones they can use -- such as YouTube and Facebook -- or block the apps you don’t want them to use. You can also see the top apps used by your kids. See the terms your kids are searching for on their PC or iOS devices to find out more about their interests. Help your kids set limits around their device usage and establish healthy habits that’ll serve them throughout their lives. Set time limits or schedule what times of the day or week your kids can use their PC, Android or iOS devices. See when kids are connecting and what they’re doing via email reports or the parent portal. Norton Family has tools that show you what your kids are doing online and flag unsafe behavior so you can talk about it. Encourage your child to ask for an exception to a blocked site or house rule. Find out when your child attempts to visit a blocked site so that you can talk about it. Get detailed reports on what your kids are doing online, right in your inbox. Norton Family Premier is now included with Norton Security Premium. Stay on top of how much time your kids spend on their PCs, Android and iOS devices. Foster healthier habits by scheduling specific times of the day or week each device can be used and how many hours a day can be spent on each device. 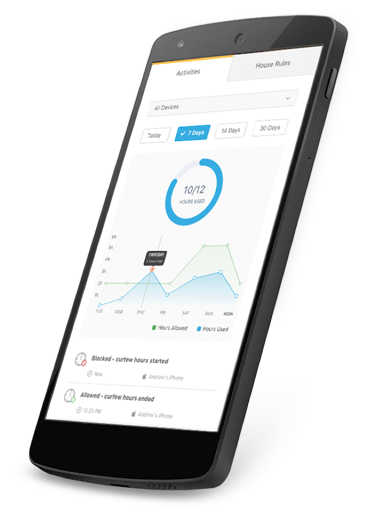 See at a glance what your kids are doing on their connected devices and how much time they’ve spent on their PCs, so you can clearly spot trends and emerging habits. Stay in the loop about your kids’ online activities from your mobile device and adjust settings when you’re on the go. Keep an eye on your kids’ SMS text conversations and set limits on who they can text. See a list of the YouTube videos your kids watch on their devices and even view a snippet of each video, so you know when you need to talk. Parents can help kids take a break by locking the device, so they can re-focus, or join the family at dinner. Once in lock mode, all of the device's applications, web browsers, games, Microsoft products and more are inaccessible, until manually disabled via the Family Portal. Individual devices can be unlocked with a PIN. Parents and children can still contact each other while the device is in lock mode. Opt to receive detailed reports of what your kids are doing online, right in your inbox. Defends against viruses. spyware, malware and other online threats. Includes our 100% guarantee: We'll help keep your device virus-free or give you a refund. 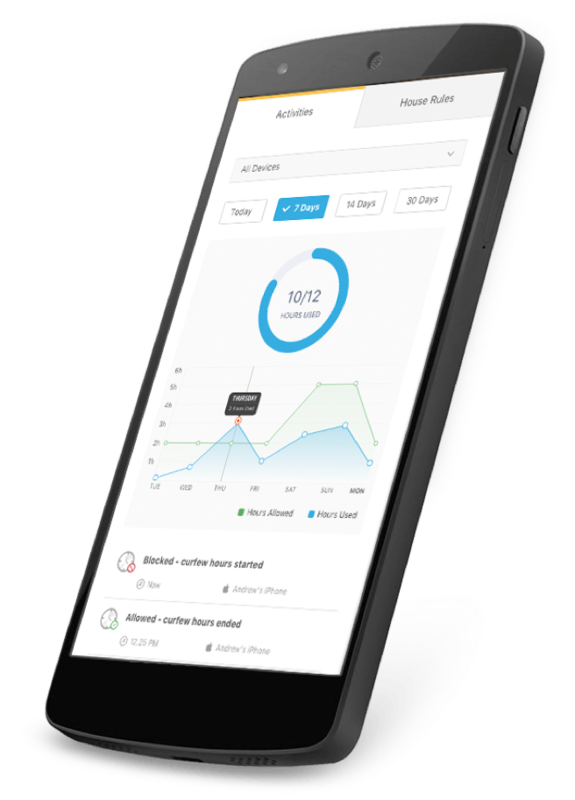 Protects up to 10 PCs, Macs, Androids, and iOS devices with a single subscription. Automatically backs up your photos. financial files and other important documents of your choice on your Windows PC. Includes 25 GB of secure cloud storage for your PC with the option to add more as your needs change. 3 Text Message Supervision requires parent activation before use. Text Message Supervision is available in all except these countries. 6 Virus Protection Promise: To be eligible for the Virus Protection Promise, you must purchase, renew or upgrade your Norton subscription directly from Symantec, or subscribe to the Norton Automatic Renewal Service. If a Norton expert is unable to remove the virus from your device, then you may receive a full refund on the actual price paid for your current Norton subscription term, or the term of your current Norton subscription bundle. The refund will be net of any discounts or refunds received and less any shipping, handling and applicable taxes, except in certain states and countries where shipping, handling and taxes are refundable. The refund does not apply to any damages incurred as a result of viruses. See Norton.com/guarantee for details. Your subscription includes protection updates and new features as available, subject to the acceptance of the Norton License Agreement. You will have coverage on the specified number of devices during the subscription term. Features may be added, modified or removed during the subscription term. By subscribing, you are purchasing a recurring subscription, which will automatically renew annually after the initial term you purchase. Accepted payment methods for automatic renewal of your subscription are credit cards or debit cards. If you select a different payment method, your subscription will not automatically renew, and you will need to renew manually. The price quoted today is valid for the initial term of your subscription (i.e., 1 year or 2 years, depending on your selection). After that, your subscription will automatically renew and be billed at €39.99 each year. The price is subject to change, but we will always notify you in advance. The price quoted today is valid for the first term of your subscription (i.e., 1 year or 2 years, depending on your selection). After that, your subscription will automatically renew and be billed each year at $32.99 for Norton Security Standard, $44.99 for Norton Security Deluxe and $59.99 for Norton Security Premium. The price is subject to change, but we will always notify you in advance. The price quoted today is valid for the first term of your subscription (i.e., 1 year or 2 years, depending on your selection). After that, your subscription will automatically renew and be billed each year at R 500 for Norton Security Standard, R 700 for Norton Security Deluxe and R 1000 for Norton Security Premium. The price is subject to change, but we will always notify you in advance. You can unsubscribe any time at manage.norton.com or by contacting Norton Support. If you unsubscribe, your subscription will still be active for the remaining term of the subscription you have already paid for. © 2019 Symantec Corporation. All rights reserved. Symantec, the Symantec Logo, the Checkmark Logo, Norton, and Nortonby Symantec are trademarks or registered trademarks of Symantec Corporation or its affiliates in the United States and other countries. Firefox is a trademark of Mozilla Foundation. Google Chrome is a trademark of Google, Inc. Mac, iPhone, and iPad are trademarks of Apple Inc. Microsoft and the Windows logo are trademarks of Microsoft Corporation in the United States and/or other countries. The Android robot is reproduced or modified from work created and shared by Google and used according to terms described in the Creative Commons 3.0 Attribution License. Other names may be trademarks of their respective owners.